The Astound Group Inc. has recently been awarded over $37,000 in Ontario training grants to carry-out its latest workforce development project. The Oakville manufacturer has accessed third-party training programs to help its employees address specific processing requirements. In addition, trainees will be able to analyze the company’s financial status to make rational business decisions. To support its commitment to improving operational processes, Astound Group received funding for workforce enhancements through the Canada-Ontario Job Grant. Ontario training grants have helped the company reduce the cost of implementing a new Enterprise Resource Planning (ERP) system. Trainees will learn how to effectively perform daily ERP operations and enhance their technical skillsets. We recently spoke with Astound Group’s Director of Technology, Steven Chia, who shared the company’s recent success accessing Ontario training grants. Steven explained how important it was to secure government funding and the critical role Mentor Work played throughout the funding process. – Steven Chia, Director of Technology, Astound Group Inc.
Astound Group Inc. is a global design and fabrication provider that specializes in the delivery of contemporary exhibits, events, and specialty construction projects worldwide. The company was founded in 2001 and currently employs over 200 employees across Canada and the United States. To improve its day-to-day operations, the business continuously looks for ways to solve internal technical challenges to become more efficient. In April 2017, the company was awarded $37,216 in Ontario small business grants to provide Intacct Enterprise Resource Planning (ERP) system training to its employees. The new ERP system will allow Astound Group to automate important financial and operational processes, reduce reliance on spreadsheets, and gain access to greater, real-time visibility. In addition, the ERP system will enhance each trainee’s role by configuring workflows, screens, and preferences, without incurring costly coding or scripting expenses. The Canada-Ontario Job Grant supports employers by providing training grants to help businesses invest in strategic workforce development initiatives. Eligible applicants can access Ontario small business grants to enhance their workforce by upskilling new and existing employees. Ontario government funding can be used to offset third-party training programs that support operational and productivity enhancements. Eligible applicants can access up to 66%-83% of eligible training costs to a maximum contribution of $10,000 in government grants per trainee. After successfully leveraging Ontario training grants, Astound Group’s executives are looking for additional funding opportunities to support future workforce development initiatives. The company is currently considering post-secondary and recent graduate hiring grants to access fresh talent. As additional opportunities arise, the company will be looking to align its upcoming projects with government grants and loans. Government grants and loans are an essential business too that can help accelerate growth and development. By staying up-to-date on current government funding programs, business owners can ensure they never miss an opportunity to access small business grants. 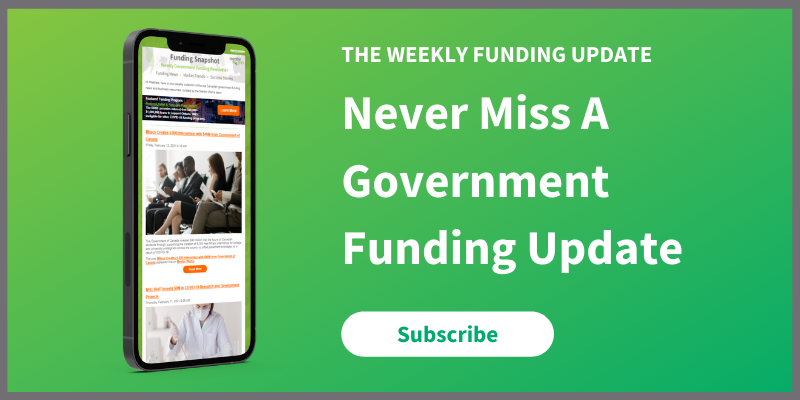 Register for Mentor Works’ Weekly Funding E-Newsletter to learn more about Ontario government funding opportunities for your business.